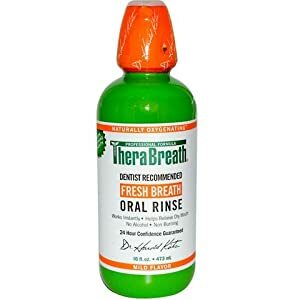 ADA APPROVED ORAL RINSE: TheraBreath Fresh Breath Oral Rinse has been a leading oral rinse for more than 20 years. It has been approved by the ADA and become one of America’s best-selling specialty oral hygiene treatments for halitosis. STOPS BAD BREATH: This certified kosher oral rinse attacks sulfur-producing bacteria and destroys morning breath and food odor. Clinical studies indicate that this product is effective at attacking bad breath odor for up to 24 hours. NO BURNING SENSATION: Dr. Katz’s Fresh Breath Oral Rinse contains no alcohols or artificial flavors or colors. It maintains a pH balance to ensure a non-acidic oral environment and prevent tooth sensitivity and enamel erosion.